Set in a unique and spectacular context, this exclusive resort offers a breathtaking view over the Island of Elba's stunning sea. This luxury farmstead is stretched over 446 hectares of grounds on the luxuriant promontory of the South-eastern part of this Tuscan island. It includes no less than 16 hectares of vineyards, standing in an excellent position and tended with passion. Winner of several prizes thanks to its high-quality wine, this vineyard is in full production and in perfect health. This luxury property includes a fantastic main villa and a residential complex composed of fifteen villas and fifty-two apartments that can sleep up to 300 people in total. There are also three restaurants, including one with sea view, a refined 2,000 m2 cellar, and a leisure area designed for complete relaxation that is composed of four tennis courts and three swimming pools. This resort was refurbished and extended in the 1970s in order to be converted into a luxury tourist accommodation facility; it has been designed with great attention to detail, and is now a lovely facility that welcomes and pampers its guests in this true haven of rest overlooking the sea. This farmstead offers the possibility to go horseriding, do yoga, go diving, enjoy wine tours and other fantastic activities offered by a well-equipped sailing centre and by a mini club for children. The largest island of the Tuscan Archipelago, the Island of Elba is the third largest island in Italy. Famous for its crystal clear sea and its green and lush land, over the years the island has seen a growing interest on the part of Italians and foreigners who have elected this place an ideal vacation spot, best tourist destination and the perfect area where to buy a luxury villa to be able to fully enjoy the many attractions that the island offers. Initially known for its deposits of iron, the Island of Elba has managed to win a place of honour in tourism thanks to its warm and windy climate and the beauty of the various beaches located along the coast: beaches with granitic rocks, of golden sand, white gravel, iron. 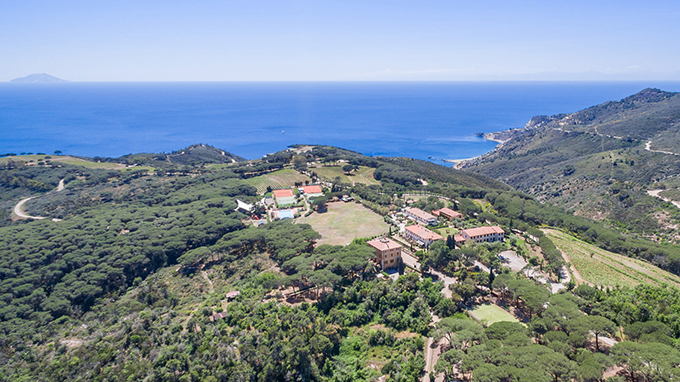 In this Tuscan island, so unique and enchanting, luxurious villas facing the sea have arisen in recent years, prestigious properties with all the amenities to be able to take full advantage of the beauty and attractiveness of an exclusive land, a wonderful place that is intimate and familiar at the same time. This charming luxury villa with annexes and swimming pool for sale is in Tuscany, in Pistoia's countryside. On the suggestive landscape of the Chianti hills, inside of a village dominated by an ancient castle of the Xth century, farms used in the past as gunpowder magazine of the surface of 597 m2 surrounding by 1651 m2 of garden. Villa in Tuscany on the hills around Vinci near Florence, elegant home or tourist accomodation built from a XIII century mill for 1.212 m2 with 2 hectares of grounds. Just two kilometers from Forte dei Marmi and Marina di Pietrasanta's renowned beaches, there is this wonderful luxury villa for sale.